It’s wonderful when a place completely surpasses your expectations. Every view seems sharper and more colourful, every ice-cream creamier and tastier, every exchange with a local friendlier, and every passion fruit poncha (the strong local cocktail made of rum, honey, sugar and lemon rind) more potent and delicious. Madeira definitely exceeded our expectations. 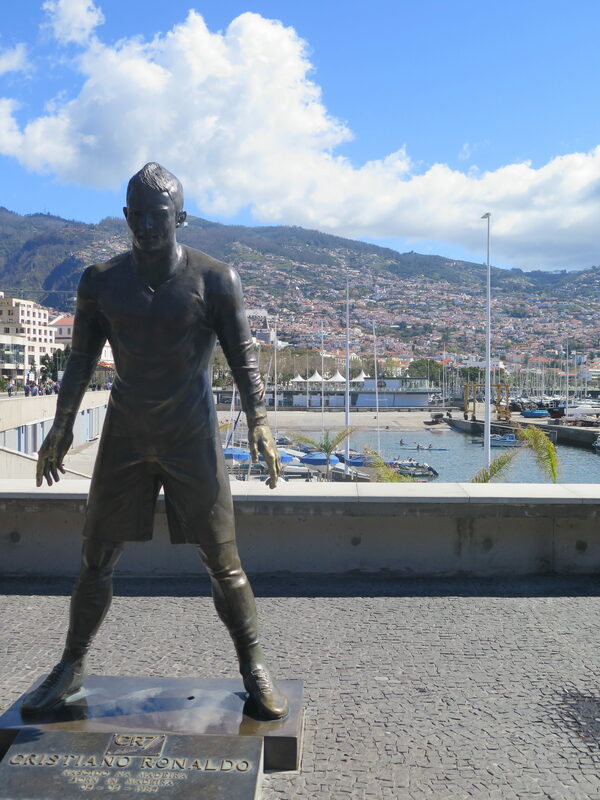 The only thing that didn’t exceed expectations was the statue of Cristiano Ronaldo outside his Pestana C7 hotel and museum. A curious, hideous looking thing that does no justice whatsoever to the strapping, handsome athlete who graces Europe’s finest football fields. Ronaldo himself was on our same itinerary this week – as Portugal were playing Sweden in a friendly organised as part of the celebrations of of the man and all he has done for Madeira, and for that he got the airport named after him this week (much to the chagrin of the locals we spoke to), and another abomination of a bust for the masses to plant kisses on and take photos next too. But Madeira was famous long before Ronaldo. The Portuguese arrived here in 1418 and named it for being an island covered in woods, and it rose to become famous for producing sugar, wine and embroideries. Over the years, it’s natural beauty, isolation, traditions, and hospitality of the people attracted and mesmerized countless travellers. An autonomous region of Portugal since 1976, Madeira has thrived and in 2015 was distinguished as the World’s Leading Island Destination. The cruise ships in port every day will tell you that, and the swathes of white-haired Europeans advancing on the capital, Funchal, from them. It has a nickname in the UK, Madeira. ‘Gods waiting room’ due to the disproportionate number of tourists of an advancing age. Well if I was old I’d come here to breathe my last – heaven certainly won’t be far away, and this isn’t a bad waiting room at all. 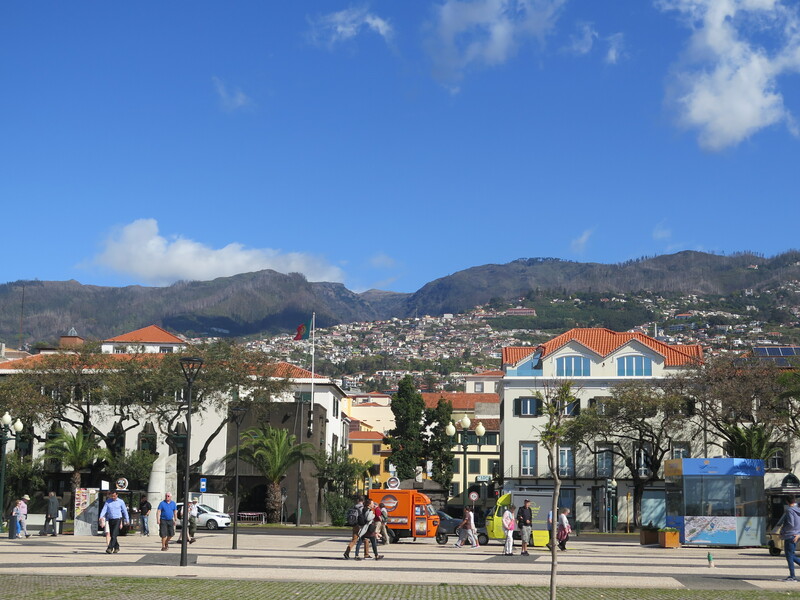 Madeira, and Funchal the capital especially, is very tourist-friendly, but that means it isn’t so friendly on the wallet. Prices are still cheap for the tourist ship masses, but extortionate for the locals, and extortionate for a traveller like me who lives in Porto. Still, with a bit of savvy (McDonalds for dinner one night, making sandwiches from the pickings of the breakfast buffet and having them for lunch each day), we made it affordable for us. Veronica and I got the 7am flight to Madeira airpot from Porto, a flight that took a couple of hours. We arrived on a lovely spring-like day, a welcome relief to the wind and rain of Porto. With the luxury of time, we grabbed the 9:15 Airport bus to Funchal for 5 euros each. The bus ride was scenic, the roads smooth, and the tunnels absolute marvels of engineering. The remarkable road system and long tunnels cutting underneath previously unsurpassable mountains, means you could, theoretically, ‘do’ the island in a full, balmy day. Trips that took many hours, up and down the hills, can now be done in a little over 20 minutes. But then, there’s no fun in that. 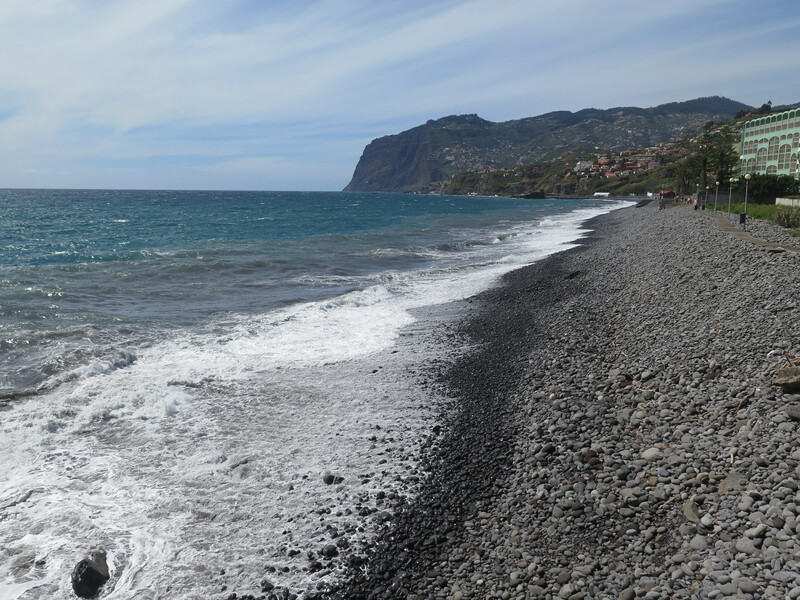 Madeira is clearly an island where it pays to linger….for without time and ease any paradise will lose value. The bus ride alone had already provided us glimpses of the deep creeks, towering sea cliffs, lush valleys, graceful villages, and scened manicured to glance left, wild to glance right. We were looking forward to spending a little time getting to know the place a bit better. 30 minutes later we were dropped in Funchal and into the heat, noise and aggressiveness of a city. Except we trundled our suitcases up the main road and turned left, and suddenly we were in the calm of a little European village, with cobbled streets and local shops and lovely old houses. We asked a few helpful locals for directions to our hotel – the well-positioned Hotel Do Carmo, a simple place with interior design from the late 1960s – think old typewriters, black and white movie star pictures, and colourful 60s motifs. Delightfully, it has an incredible sun-deck with a pool and a view of the ocean in front, the stunning hillsides behind. We were too early to be shown our rooms, but it wasn’t too early to enjoy the complimentary welcome drink – a glass of cava that went straight to the head. The friendly receptionist Victor took out a map and showed us where we were and how to get to the marina, and told us a little about the tours they offered in conjunction with a tour agency. We left our hand-carry cases there, and were straight out into the morning. It was still early – 10:30am, and we had a lot to do. There’s nothing quite like that first walk in a new city. The smells, the sights, the sounds, the taste of adventure…an addictive combination and the scenes need to be captured on a camera, because some of them only prove to be different and special enough once. The next time you walk past the same spot, the magic is largely gone. 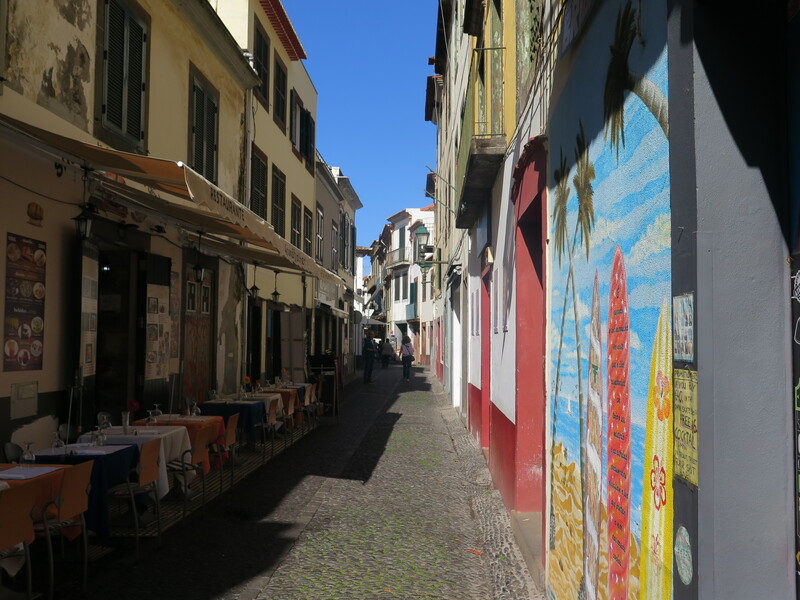 We wandered down the narrow cobbled roads to Rua de Santa Maria – a quaint street lined with tables from different cafes and restaurants, and a pleasant early lunch vibe. 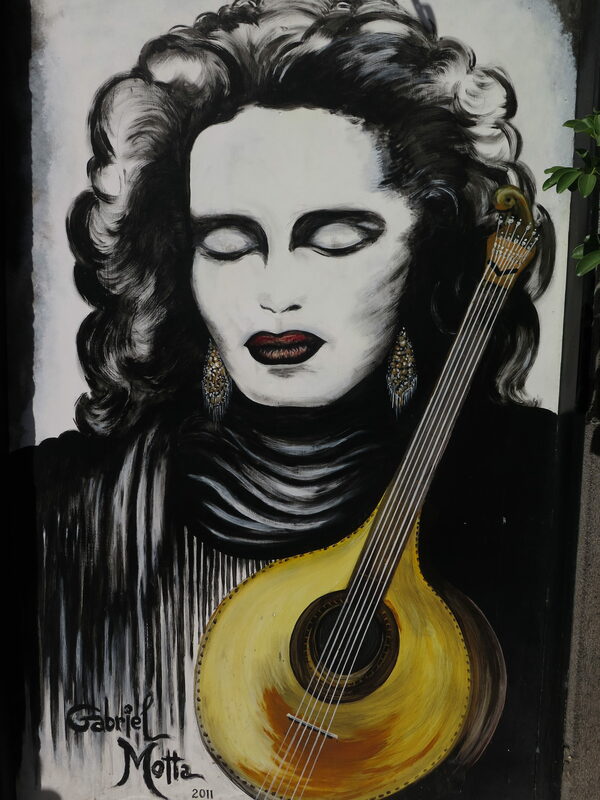 Many of the doorways here have been colourfully painted, and there are some creative designs, if rather random, but they add to the general colour and flair of the place. There was a buzz of energy growing as lunch hour neared and hungry tourists were on there way. From here we swung right into an attractive square with an orange tree and a little church – little churches are everywhere in Madeira. There were more restaurants here, and then we found ourselves by the cable car that takes you up to the mountains. From down there, the city spreads up and out, housing stretching up the hillsides behind the city. Funchal is very favourably located. The bay is beautiful, and the amphitheatre of the hills behind do make for quite a spectacular setting. We wandered further down around the bay now, towards the marina, and towards the Pestana C7 landmark hotel, all the while stopping to admire the beautiful hillsides, and the bay with it’s pebbly beach curving around to the sea cliffs. 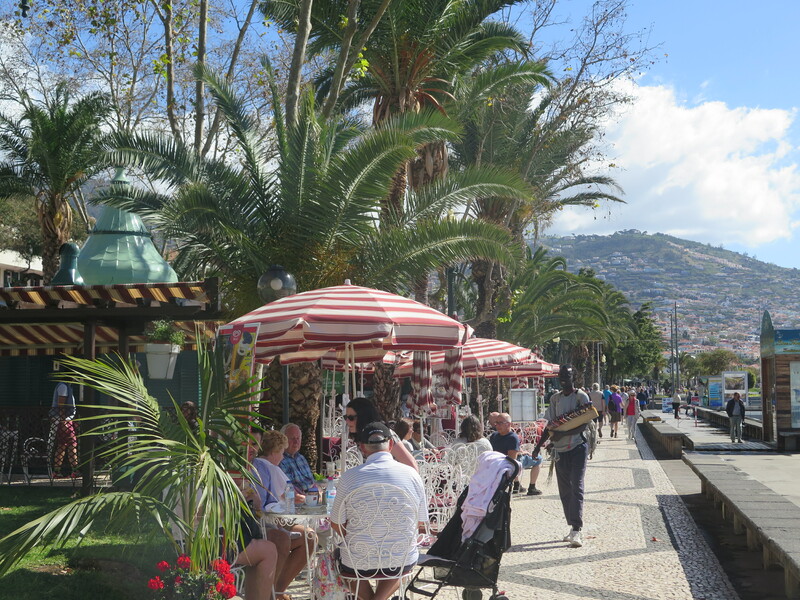 There were plenty of tempting cafes set up along the route too, in front of manicured lawns full of colourful flowers for which Madeira is also famous (the flower festival taking place in May is one of the biggest attractions of the year on the island). The weather was warm and spring-like….becoming hot as the day wore on. 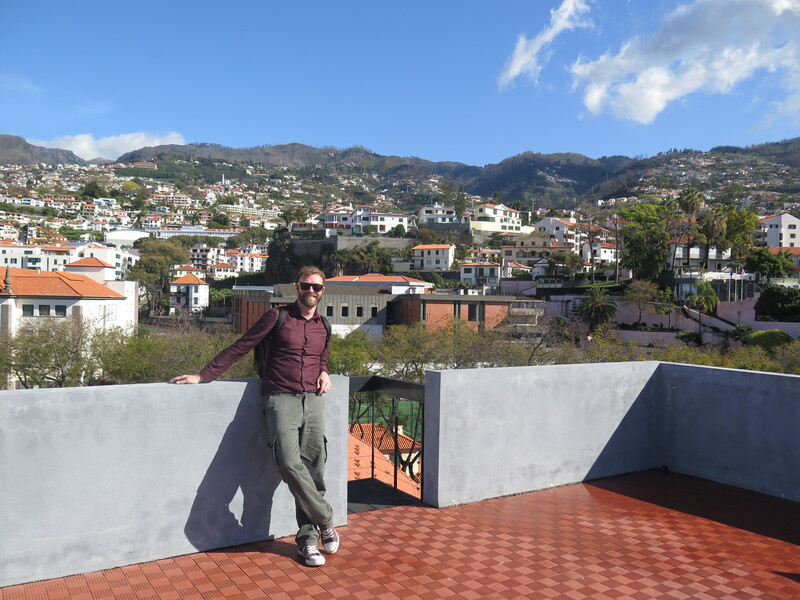 The weather in Madeira is fantastic….it’s always warm. Having said that, locals also say there are 4 seasons in one day, and they often talk about it being cloudy and wet in the north, but warm and breezy in the south. Like Porto and Lisbon, then. There can also be snow on some of the higher peaks too. But, all in all, the weather is very favourable indeed, year round. Lots of cafes in Funchal to rejuvenate in. We stopped for a beer at the CR7 hotel. A Coral. Brewed here in Madeira. Crisp and clean, and perfect for a summery day, looking at the marina. From here we decided to catch the bus to Lido. Lido is where most of the package hotel tourists from the UK come. I don’t know this as a fact, but the number of Indian and Chinese restaurants and pubs like ‘a hole in one’ certainly seemed like it. The place is full of high rise hotels of every star. There’s plenty to do, and some beautiful coastal walks to go on. We started by heading down to the coast, where you can choose from a number of very expensive tourist restaurants, or do as we did and head a bit further up to a little cafe with nice outdoor seating and sweeping sea views where a ham and cheese sandwich sets you back 2 euros, and a cafe latte 1 euro 50. Refuelled, we headed on an incredibly scenic walk along the coast, a steep walk at times, and one which led us past natural swimming pools, around stunning sea-cliffs, through tunnels carved into the rock, and onto the black sand of Praia Formosa, with plenty of obligatory bench stops to sit and admire the views. 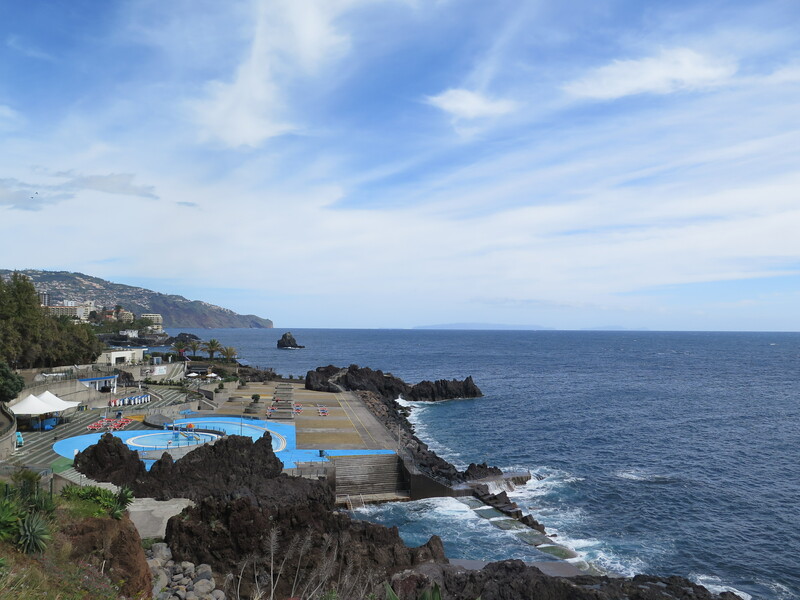 This part of Funchal really is spectacular….the waves crash against the cliffs and pound the sand, and the little tunnel you walk through drips as the waves roar and smash it from the side, the tunnel echoing the sounds alarmingly loud. We got the bus back, seeing for the third time that day a wiry bearded Croat who was travelling with just a little plastic bag with his swimming trunks in looking for a natural pool to his taste. He hadn’t had any luck. He said he was going to try a place tomorrow closer to Funchal. We wished him luck. We went back to the hotel and were shown our room. Simple. Nothing special. But then, for the special price we were paying, we’d already used all the special up. We crashed, exhausted, a much needed siesta. When we awoke at nearly 8pm the sun was just slipping away, and we changed and got ready for the night. It was cool at night, we needed a light jacket. The streets were very quiet as it was Monday. We headed once more to the Rua De Santa Maria, and found the cheapest place we could find, a place offering two courses for 7 euros 50, with a soup or salad, passionfruit sauce fish, and a coffee. The beer pushed the price up – 4 euros for a caneca! The atmosphere was subdued but pleasant. A local band was walking up and down playing Madeiran folk music. Couples were sitting on outside tables enjoying a bottle of wine. It was nice. From here we hit a bar which claimed to serve the ‘best poncha in town.’ We tried the famous passionfruit poncha. It really was good. Potent too. The bar was small but good to spend an hour over some ponchas, and we talked about the adventures of the day and the plans of discovering the east and west coasts to come. 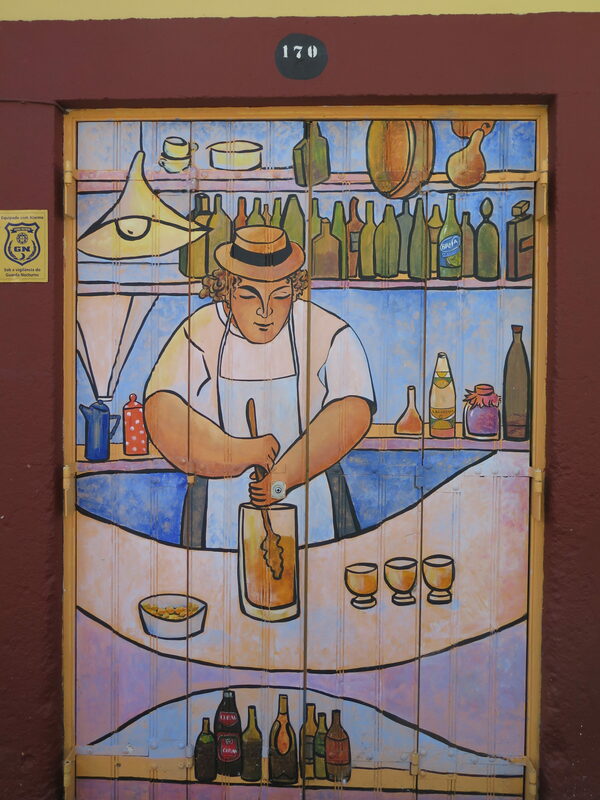 Doorway of the Poncha Bar, showing the barman making the potent local firewater. We walked back to the hotel stomachs full, and spirits high. If this is what God’s waiting room is going to be like, we have nothing to worry about.